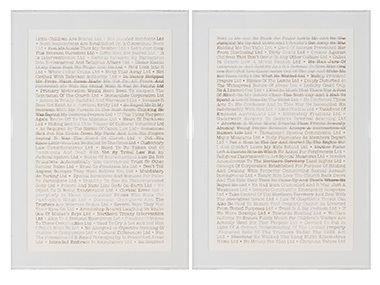 Shevaun Wright, a previous finalist and 2012 winner of the UNSW Art & Design Indigneous Professional Development Award, has this year taken out the $40,000 NSW Parliament Aboriginal Art Prize with her controversial entry, Site Specific Work [Suggested Corporate Names - Catholic Child Abuse Compensation Entity] - chosen by judges Stephen Gilchrist, Julie Gough and Liz-Mare Syron. Shevaun, who is also a practising lawyer, is on something of a roll, having completed a residency as a fellow of the Art & Law Program in New York, and also being asked to participate in the Whitney Museum of American Art Independent Study Program later this year. Winning the 2015 UNSW Art & Design Indigenous Professional Development Award (which includes an Artist Residency at UNSW and a solo exhibition at EPS Gallery) is Aleshia Lonsdale for her mixed media work, Significant to whom for what? 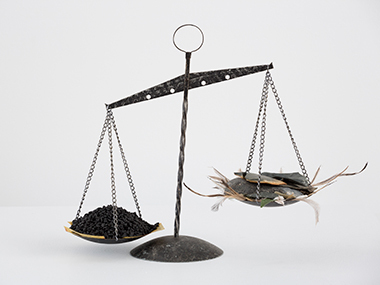 made of stone tools, emu feathers, polymer bank notes and a set of scales which, “reflects the imbalance in the system which assesses and approves major coal mining developments”. Shelley Hancock MP opened the ceremony saying the Parliament of New South Wales was proud to have supported the growth and development of the Prize, and the opportunities it has provided to finalists and winners. “It has been wonderful to witness the level of recognition for and appreciation of contemporary Aboriginal art by the Parliament and the community,” she said. In thanking the judges, Don Harwin MLC said that, “The winner of the Prize is always chosen by an independent panel of judges. Each year, the judges select a diverse exhibition of finalist works and the 2015 Parliament of NSW Aboriginal Art prize is no exception”. Other speakers included Troy Grant MP, Deputy Premier and Minister for the Arts, Cr Paul Hawker, Mayor of Campbelltown City Council, Prof Ross Harley, Dean, UNSW Faculty of Art & Design and Norma Ingram, who performed a Welcome to Country. The Parliament of New South Wales Aboriginal Art Prize will be on display at the NSW Parliament on Sydney's Macquarie Street until 2nd November, when it starts its tour of selected regional galleries. Entry to the exhibit is free and open between 9am to 5pm Monday to Friday.